I have been talking a lot about what I want to do with my house. Decorating is super fun for me and I put a lot of time and thought into it. We are going to have a loft in the new house that we will be using as our office. It will be the official head quarters of Disney Fashionista and Chipandco. I think a Walt Disney quote on the wall is in order. There are so many amazing ones but this one jumps out at me as I never thought in a million years that I would be able to have a successful blog based on my passion for fashion and Disney. 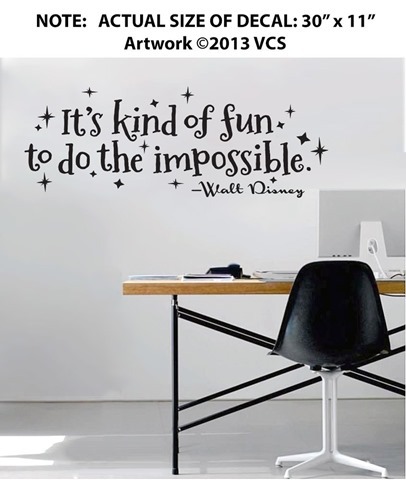 Let’s take a look at today’s Disney discovery… the Walt Disney quote decal. There are actually two different versions of the quote I am interested in. The above is more fun and whimsical to me. 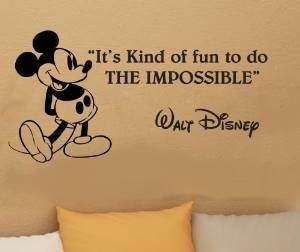 The both say “It’s kind of fun to do the impossible” – Walt Disney, however, this one seems more magical somehow. I say this before I show you the next one because I know some people will be angry at me for saying this. The next one has Mickey in it. I am not saying Mickey isn’t magical, he clearly is. I am saying that the font and the stars in this one make me feel like I have pixie dust in the room. This one can be found here for $9.99 plus shipping, if you are interested as well. This one, however, has Mickey Mouse in it and the signature is Walt’s signature. This part makes me torn. I mean, which one will look better in our office? What do you all think? This one can be found here for $25.99 plus shipping. They both make the same point but are completely different at the same time. Help me pick which one!! Let me know your thoughts in the comment box below. In the meantime, happy shopping everyone! I like the first one!! It’s different then the typical Disney quotes you usually see. I like the whimsical look. Thanks for the input! I think I agree!